Get The Contact Information You Need To Get Your Music In TV, Films And More. Up To Date Contact Information For Music Supervisors, Music Publishers, Video Game Companies, Music Libraries And More! License Your Music! Wondering how to get your music into the right hands for licensing opportunities in Film, Television and more? Fortunately there are LOTS of different places looking for original music to license. There are music supervisors, music publishers, music libraries, video game companies, music production houses and music licensing companies that are all in need of original music. It's amazing how many different opportunites there actually are, when you realize how many different companies there are looking for original music! Researching and compiling this information can be quite frustrating and time consuming though. It can take valuable time away from making and recording music! How To License Your Music.com's 2013 TV, Film And Video Game Music Business Directory is a comprehensive and up to date list of over 1,200 supervisors, publishers, music libraries, music departments and video game companies that are all in the business of licensing music. How To License Your Music.com's Music Licensing Business Directory is one of the industry's most respected directories for up to date contact information for professionals working in the business of music licensing. Published since 2007, the annual directory provides the most up to date and thorough contact information for music licensing industry professionals. "Hey Aaron, Thought I would pass on the fact that I got my whole catalog (47 tunes) signed to one of the libraries in your directory. Thanks for your help!" "Most targeted info I've received in a long time. I've had 14 placements and 4 internationally distributed ringtones since then". 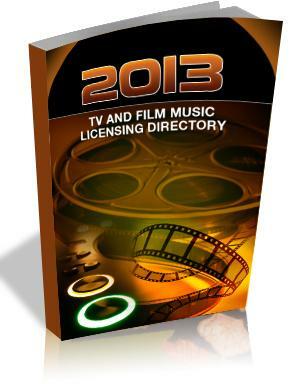 Please note: The 2013 TV And Film Music Licensing Directory is available as a PDF file. The directory will be delivered via email immediately upon checkout.